Help! In the next two months I have three occasions I need to frock up for. The first is a cocktail affair, the second a ladies race day and the third is the 40th birthday party of one of my besties. I’m not in a position to buy a new dress and accessories for each of these events so I’m wondering if you could help me find the perfect dress, (preferably under $150) that I could style three ways? What an excellent question, thank you, and one I bet many of us have asked ourselves. 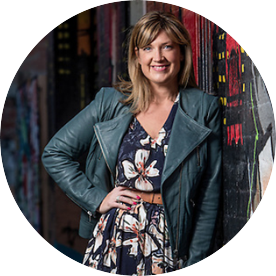 Most of us can’t justify buying several dressy frocks when most of our time (and money) is spent in and on the clothes we spend most of our time wearing. But at this time of year, our collective social lives tend to go into overdrive. There are so many dos. So many outfits. But can one frock meet all our needs? a black and white striped dress. Well, black and navy dresses can be worn with metallic footwear and accessories, all of which are available at a range of price points. 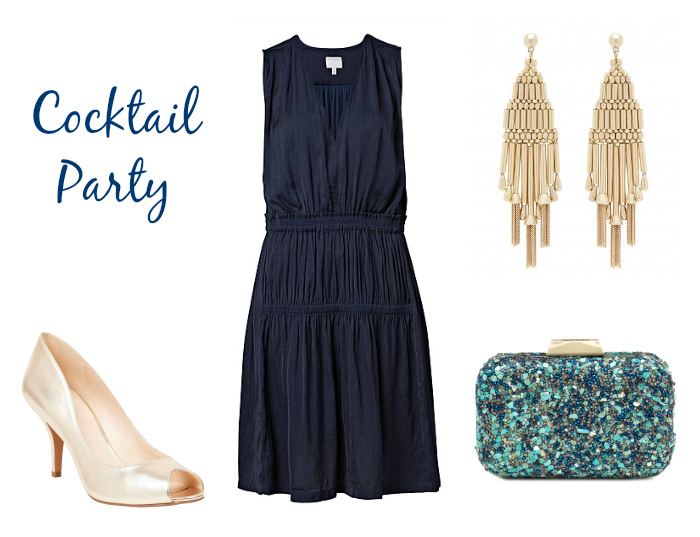 Not only is this look so on trend right now but it’s also perfect for cocktail and birthday parties. Both black and black/white striped dresses are classics and work well with existing black shoes and accessories and a gorgeous bright lip. All are perfect canvasses for pop of colour too – from acid yellow and tangerine, through to reds, pinks and greens. Importantly, these styles are available at a range of price points right now, with several options under $150. 1. Jacquie Square Neck Wrap Dress, $99.99 from Forever New; 2. V Neck Gather dress, $129.99 from Witchery; 3.Strike it Lucky dress, $119.99 from Portmans (also available in a gorgeous cobalt blue); 4. Stripe Zip Front Fit and Flare Dress, $129.99 from French Connection; 5. Natalie Ottoman dress, 149.99 from French Connection; 6. Lia Prom Midi Dress, $149.99 from Forever New; 7. Asymmetric Hem dress, $149.99 (on sale and currently available in sizes 4 – 16) from Country Road; 8. Gathered waist dress, $171.75 (currently 25% off and also available in a saffron yellow) from Country Road. In terms of styling them, here’s how I would style one of the navy dresses. I’m using the V Neck Gather dress from Witchery, (2), above, as the “model” but you could substitute any of the above navy dresses – particularly the navy Gathered waist dress from Country Road above too – or a dress you already have instead. This dress, with it’s V neck, elasticised waist and A-Line skirt is a shape that is forgiving and will suit many. Navy suits most, is classic and on trend all at once, so it’s both a practical choice and a change from the usual black. So, let’s start with the Cocktail Party. Usually the dress code is a bit vague but I don’t think you can go wrong with heels and a bit of bling. Orissa Peep Toes, $99.95 from Nine West; V Neck Gather dress, $129.99 from Witchery; Hunter Tassle Drop Earrings, $14.99 from Forever New; Turquoise Pebble and Crystal Pod, $169.95 from Olga Berg. I’m a huge fan of navy with metallic accents and accessories. Traditionally, navy has been paired with silver, but this summer, try it with gold or the pinkier tones of rose gold as I’ve done in the third outfit below. In the outfit above, the statement piece is this beautiful hard clutch from Olga Berg. It picks up the navy in the dress and introduces some lovely textural and metallic detailing. It’s an investment piece by most standards but would also work well with grey, turquoise and white. The gold hardware on the clutch is picked up and complemented by these simple but chic gold peep toes and these fab, well priced earrings from Forever New. Make up wise, I’d keep things pretty simple here with a smoky eye and a glossy blush pink lip. 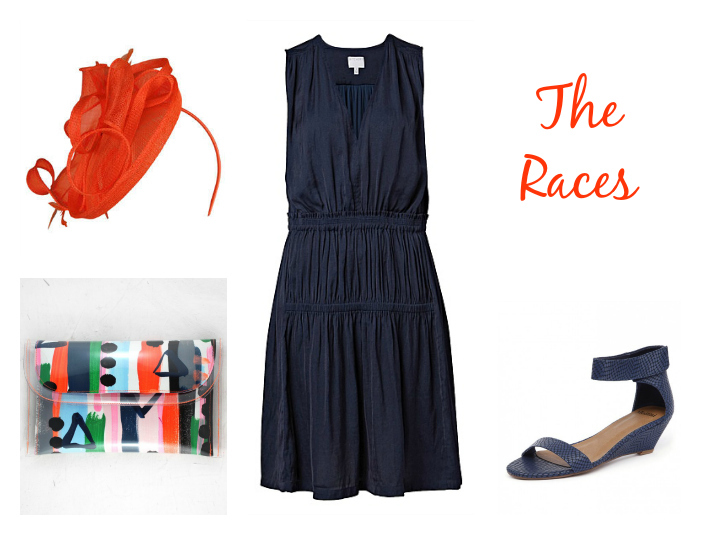 This dress is also an ideal choice for the races. Just add a fabulous fascinator, a statement clutch and a bright lip and you are good to go girlfriend! Morgan & Taylor Fascinator, $99.95 from Myer; Natural History Mini Clutch, $79 from Tiff Manuell; V Neck Gather dress, $129.99 from Witchery; Marsy Wedge by Mollini, $139.95 from Style Tread. This versatile and rather fabulous Tiff Manuell clutch with it’s pops of colour make it the perfect partner for any block coloured dress. I could have picked up the emerald green, grey, aqua or pink but I’ve gone for this lovely deep orange as I’m a big fan of navy and orange together. I’ve opted for a wedge too to cater for long periods of standing and walking to and fro the event. As Race Day in a suburban backyard or going to the races often involves standing on grass, you don’t want to be wearing stilettos that sink into the turf. That could get a bit messy after a champs or two. I have a couple of pairs of these Marsy wedges from Mollini (in hot pink suede and white leather – see the full range here) and I j’adore them. They’ve been on high rotation for me in summers past because they are high enough to elongate legs but comfortable enough to wear all day long. Make up wise, I’d go for simple eye make up and a candy pink lip here to complement the bright tones in the bag and fascinator. 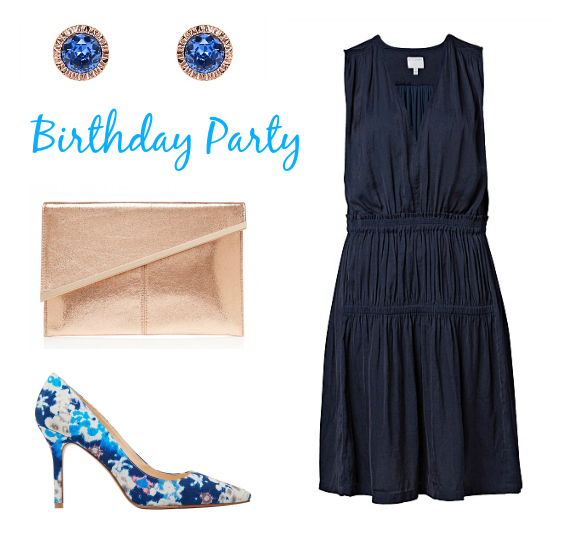 And finally, here’s how I’d style this dress for a dressy birthday do. I happen to be the birthday girl in question here and I think this outfit would be perfect for my celebratory soiree. There’s not usually a dress code for a birthday function but take your cue from the style of venue and the time of day. For an evening do, I’d usually pop on a frock and pair it with a couple of statement accessories and most of all, have fun. Facet Bezel Stud, $59.95 from Mimco; Kaylee Clutch, $29.95 from Forever New; Martina Pumps, $139.95 from Nine West; V Neck Gather dress, $129.99 from Witchery. I pretty much love everything about this outfit – the gorgeous printed statement shoe (I die – it also comes in a pink/red colourway) which would breathe new life into many a block coloured dress not to mention a simple jeans/white knit/shirt scenario. Rose gold is so lovely (not to mention bang on trend) and works beautifully with navy. And how fab is this rose gold clutch? It’s super chic with it’s clean lines not to mention it’s great price point. The warm tones of the rose gold also pick up the blush pink in the printed shoes. These simple but gorgeous Mimco jewelled studs complement everything that’s going on in this outfit perfectly and are versatile to wear across work and smart casual wardrobes. So there you have it – one new season navy dress styled three ways. What did you think? For more outfit inspo, check out my Friday’s Frock series where I’m featuring new season frocks from smaller labels every Friday in Frocktober and my What to Wear to the Races series. How would you style it? 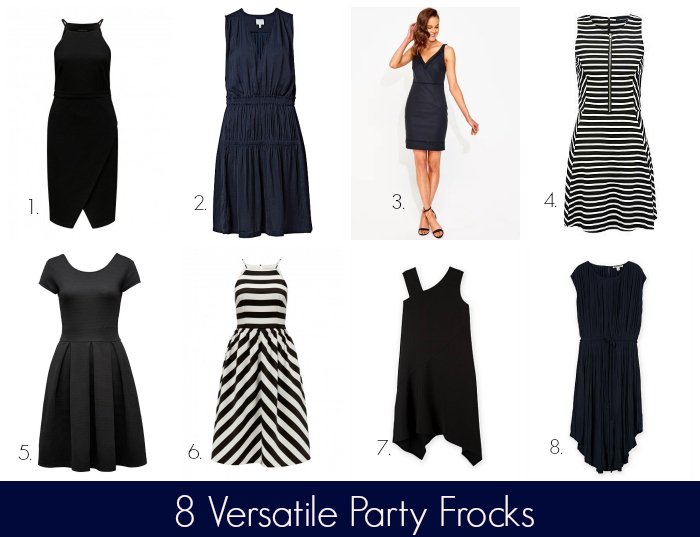 What does a versatile dress look like to you – style and colour wise? What’d your pick of the above?